Euro continues descending movement. In the near term, price may reach the group of the nearest fibo levels at 1.3380 – 1.3375. Consequently, if price rebounds from this price area, it may start new deeper correction. 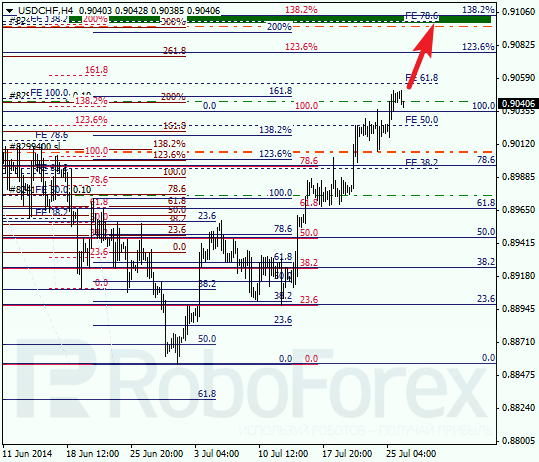 As we can see at H1 chart, bearish targets are confirmed by local fibo levels. According to analysis of temporary fibo-zones, price may reach lower targets by the middle of the week. Franc is still moving upwards without any deep corrections. Main target is still the group of upper fibo levels at 0.9105 – 0.9095. Stop loss on current orders will be automatically moved into the back. At H1 chart, local correction is practically completed. The main target area is confirmed by local fibo levels. According to analysis of temporary fibo-zones, price may reach the upper price area by Wednesday.